Need audio enhancement or music album mastering services? Whether you have recorded your audio at a professional studio or your garage, make certain this critically important stage of audio production is done by an experienced audio mastering engineer that specializes in music mastering services and audio enhancement and restoration services. For audio engineer mastering and audio enhancement services email or call our Orlando Orange County location at (407) 610-2451 for same-day service availability..
We can give any audio recording a new life or a music album the means to be competitive in the world of commercially released music album material. All professional music artist audio recordings are mastered regardless of where and how they were recorded. Mastering of an audio is an important process in unifying the sound of a record, maintaining dynamic and frequency range consistency across an album, and preparing the audio mix for CD duplication, CD replication or other means of digital audio distribution. Vaskevich Studios will help you to correct audio mix balance issues and enhance particular sonic characteristics by referring to a high-end industry standard. Audio mastering is also called “sweetening”, which produces a drastic improvement of an audio recording in terms of dynamics, which results in a difference between a good-sounding mix and a professional-sounding, finished audio master. For Audio Mastering Services email or call our Orlando Orange County location at (407) 610-2451 for same-day service availability. Express audio mastering service is available upon request. We can provide the audio services on the same day we receive the audio materials. Our audio mastering service complements our marketing video production services. 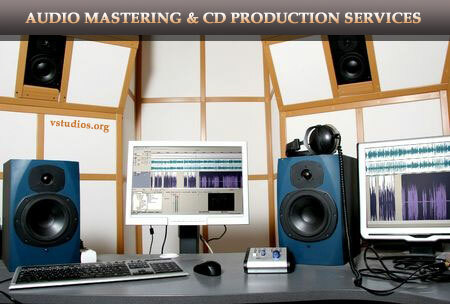 All audio mastering services are performed in-studio. 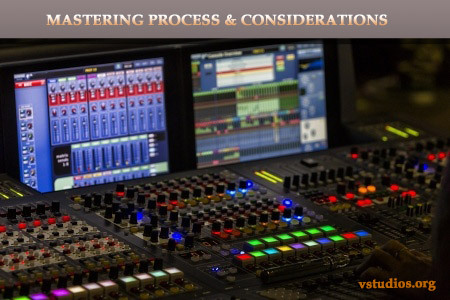 We do not outsource or hire third party engineers to provide audio mastering services. Providing audio mastering services on-site helps us deliver an outstanding and fast service, which communicating with our clients directly. Once audio sweetening is complete, we check the resulting audio master for consistency to insure that individual tracks work well together when played one after another in an album sequence or in random album order. Playback consistency check is an important step in audio mastering process since playing the tracks in an album order may prove to be good, yet, a random playback will bring a different audible perspectives that may further help to refine the equalization and compression of an audio recording. All audio mastering and sweetening services are provided in-studio. We do not provide audio processing services on location. However, for audio recording assignments, we do provide audio location services. Basic travel fees are applicable when travel time exceeds 30 minutes from our studio location in center of Orlando.